The United States has picked a big fight with a powerful trading partner: Canada. U.S. trade officials said Tuesday that they plan to slap a 220% tariff on a new jetliner from Canadian manufacturer Bombardier (BDRAF). The ruling, which Bombardier described as "absurd," risks further inflaming tensions with a vital trading partner that buys more American exports than any other country. President Trump campaigned on the promise of a much more aggressive trade policy, but his rhetoric focused primarily on China. Since Trump took office, it's Canada that has often been in the crosshairs. The Trump administration has taken steps to impose duties of up to 33% on most Canadian lumber -- one of the country's top exports. At least two more disputes are ongoing: Trump wants Canada to open its market to dairy products, and a spat has erupted over groundwood paper, which is used in the production of newspapers and magazines. 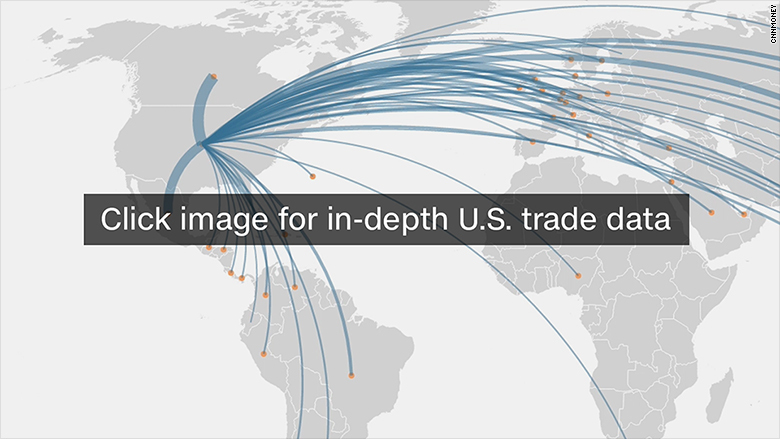 The disputes threaten to upend one of the U.S.'s most important trading relationships. 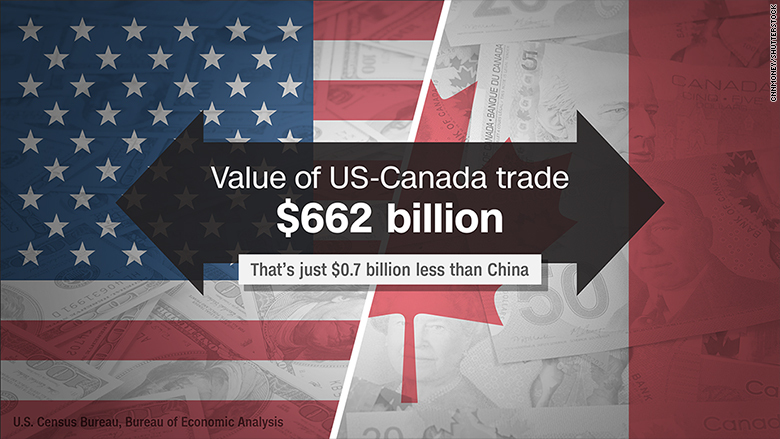 Canada is America's biggest trading partner after China, buying exports worth $337 billion each year. There are millions of American jobs that depend on the trade. There is now talk of Canada striking back. "I think where you are going to see retaliation is in areas where the Canadian government has discretion over purchasing American products," said Chris Rogers, an analyst at trade research firm Panjiva. Canada has warned that it may ditch a $5.2 billion deal to purchase up to 18 fighter jets from Boeing (BA), the American firm that brought the Bombardier case to the U.S. Commerce Department. "We won't do business with a company that's busy trying to sue us and put our aerospace workers out of business," Canadian Prime Minister Justin Trudeau said earlier this month. Canada, which recently completed a free trade agreement with the European Union, has a reputation for punching above its weight on trade issues. "Americans are so used to ignoring Canada that it would surprise most to know that Canada has a long history of fighting hard for its own interests on trade," Edward Alden, a senior fellow at the Council on Foreign Relations, wrote in June. 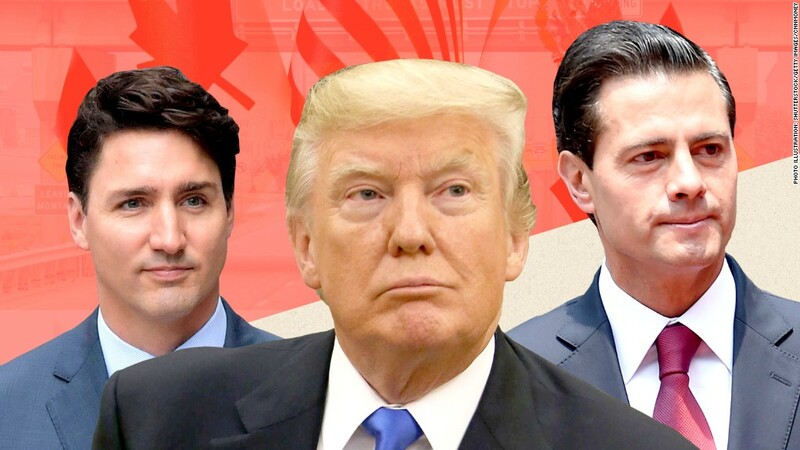 A further deterioration of the relationship could damage Trump's ability to successfully renegotiate NAFTA, the 23-year-old free trade agreement between the U.S., Canada and Mexico. Rogers said that Canada could pursue a much more aggressive "Canada first agenda" during talks, which are currently in their third round. U.S. Commerce Secretary Wilbur Ross said Wednesday that his department has initiated 48% more trade cases than the Obama administration over the same period last year. Ross expects the trend to continue, but added that Canada shouldn't take it personally. "One shouldn't get the impression that we are picking out one country here or there for some selective reason," he said at a press conference in Hong Kong. Trump, however, has not been shy about singling out America's neighbors to the north. "People don't realize, Canada has been very rough on the United States," Trump told a farmers' group in April. "Everyone thinks of Canada as being wonderful, and so do I. I love Canada. But they've outsmarted our politicians for many years, and you people understand that," he said.